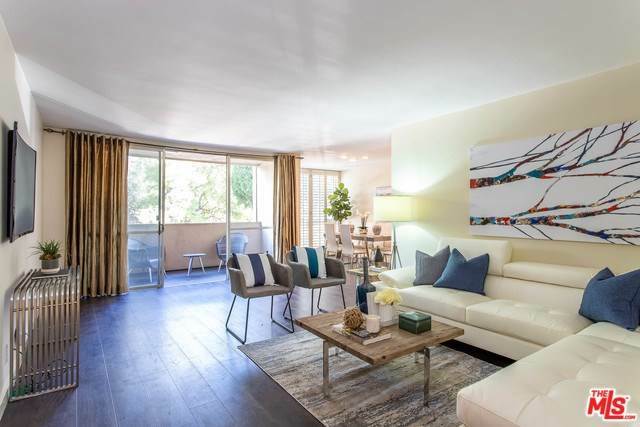 This bright, front-facing 2BR/2BA condo has a recently remodeled kitchen and a full-size washer/dryer inside the unit, which is a rare feature for a condo in West Hollywood. The kitchen has stainless steel appliances, European cabinets and a big pantry. Additional upgrades for this spacious 1,408 square foot floor plan include wood flooring throughout, modern molding, smooth ceilings, plantation shutters and custom curtains. The master bedroom suite has a huge walk-in closet and en suite bathroom with a new toilet and separate tub and shower. The large guest bathroom has a new toilet and dual sinks with new fixtures. This unit has two side-by-side parking spaces in the gated garage plus parking for guests. The HOA has beautifully decorated its lobby and hallways and has a refreshing pool in the building's courtyard. The low HOA fee of $400/month includes basic cable TV and electricity for AC. Located on one of West Hollywood's best blocks, close to dining, shopping and nightlife. Lot Size: 0.89 Acres / 38900 Sq. Ft.
SchoolsClick map icons below to view information for schools near 1015 N Kings Road #201 West Hollywood, CA 90069. Listing provided courtesy of Jason Woodruff, Keller Williams Hollywood Hill. Home for sale at 1015 N Kings Road #201 West Hollywood, CA 90069. Description: The home at 1015 N Kings Road #201 West Hollywood, CA 90069 with the MLS Number 19424124 is currently listed at $828,650 and has been on the West Hollywood market for 73 days. You are viewing the MLS property details of the home for sale at 1015 N Kings Road #201 West Hollywood, CA 90069, which includes 2 bedrooms, 2 bathrooms and has approximately 1408 sq.ft. of living area.